Recently a project was completed in San Jose State university about solar powered lawn mowers, users’ ability to cut the lawn grass with minimal efforts required. Unlike other robotic lawn mowers on the market, this design requires no perimeter wires to maintain the robot within the lawn. Lawn mower is one of the basic essential products which are required at home to arrange the lawn with grass level required. However, designing a lawn mower which should charge itself and function without any manual help is really an amazing idea, and recently such solar lawn movers have been launched. This is latest technology eco-gadget which will fulfill the requirements of grass cutting and utilizing the renewable source of energy. Through an array of sensors, this robot will not only stay on the lawn, it will avoid and detect objects and humans. This design is still in the prototype stage due to financial and time constraints. Documentation includes all major design aspects. This project will continue in hopes to market the design. 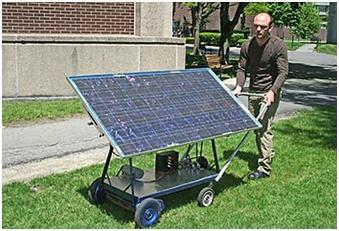 A solar lawn mower charges using solar panels embedded with its structure and cut the grass for a wide area of ground where it is circled. 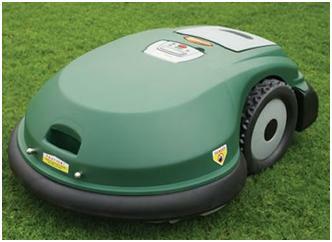 This amazing eco-friendly gadget is available in market and you will experience a new grass cutting experience with it. Here the technology used and design of lawn buddy solar powered automatic lawn mower has been explained in detail. In the time where technology is merging with environmental awareness, consumers are looking for ways to contribute to the relief of their own carbon footprints. Pollution is man-made and can be seen in our own daily lives, more specifically in our own homes. Gas powered lawn mower are in 90% of U.S. home and they create 5% of the total U.S. pollution. Green technology initiatives are being support by both the government and cooperates business. Our new design for an old and outdated habit will help both the consumer and the environment. 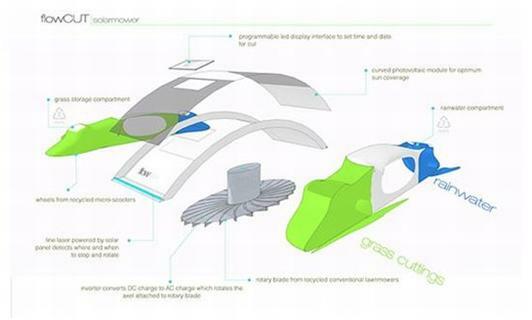 This project of a solar powered automatic lawn mower will relieve the consumer from mowing their own lawns and will reduce both environmental and noise pollution. This design is meant to be an alternate green option to the popular and environmentally hazardous gas powered lawn mower. Ultimately, the consumer will be doing more for the environment while doing less work in their daily lives. The hope is to keep working on this project until a suitable design can be implemented and then be ultimately placed on the market. This design contains a microcontroller, multiple sensors, and a solar charging system. Adding these elements together, we get our robotic lawn mower. The sensors are the eyes of our robot. The goal was to let our robot see the difference between grass and concrete while monitoring its surroundings continuously. Initially, designers had an idea what type of sensors we wanted to use. Robot needed to detect if it was on grass versus on concrete and we decided to use a humidity sensor. Since concrete/dirt and grass are distinctively different in density and moisture levels, the humidity was a good factor to distinguish both materials. In addition to sensing humidity, they wanted object detection; both humans and objects. In which case, we went with using a passive infra-red sensor to detect the heat radiation from humans and an ultrasonic sensor to detect if the robot wash The RB-Plx-75 from Parallax is a PIR sensor was chosen based on short range abilities. If the robot detects a human close up then it will stop whatever it is doing until the human leaves the area. This specific PIR sensor will output a pulse of 5V if it detects humans and will output 0V during idle. The advantage of this sensor is that it will reset itself if when it detects nothing. But if it detects something multiple times then the output will stay logic high (5V) until the human leaves the area. This feature was used in our design to let our robot know the difference between someone who is just passing by and someone else who is staying too long in the area, which is a dangerous situation. This chip has three pins: Vcc (5V), ground, and ‘alarm’ data pin. Safety is the main concern when designing a robot with blades. We wanted our robot not to start operating if it was being held in the air by the user. Knowing that the user would be randomly holding the robot we needed a sensor to detect orientation. The accelerometer was thought of being used because it can detect its orientation based on pre calibrated axis orientation. The power the system there are many options. With recharging batteries, there are various chemistries but we decided to go with the one that work best with solar charging. The nickel-metal hydride (NiMH) was found to be the best because given a low charging current, it will not over charge. Sizing the battery will depend on what we are powering, specifically the motors. Like batteries, there is a range of motors to choose from. Engineers went with two 7.2 DC motors with integrated gear heads. The needed torque did not need to be a lot because engineers were going to have a small prototype. These motors have 100 oz.-in torque which is plenty for our design.